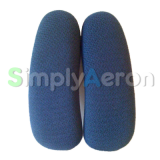 Arm Pads for the Aeron chair are available in three variations. New replacement Arm Pad Screws in Black (x..
Soft Black Vinyl Covered Arm Pads suitable for .. Original style Vinyl Arm Pads in Black. ..
New improved Vinyl Arm Pads in Black. Also..
Upholstered Fabric style Arm Pads suitable for .. Original style Vinyl Arm Pads in Grey Smoke. ..
New improved Vinyl Arm Pads in Grey Smoke. .. Brand new official Genuine Black Leather Arm Pa..